TORONTO, ONTARIO, April 11, 2018 – Toyota Canada is ready for 2018 with a full range of models designed to inspire and impress – and nowhere is that more apparent than with the 2019 Toyota RAV4. The next generation of this popular compact SUV makes its Canadian debut at the Edmonton Motorshow this month. The 2019 Toyota RAV4 expresses adventure and refinement in equal doses. 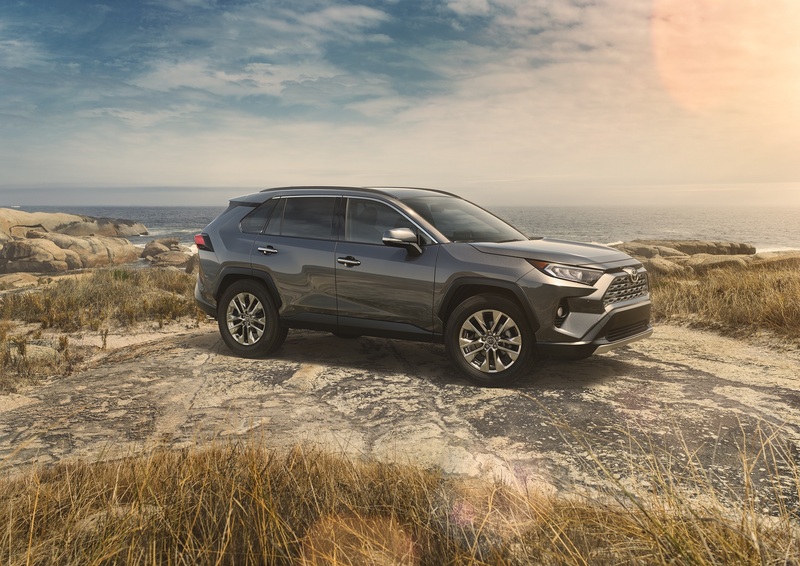 The first RAV4 to benefit from the Toyota New Global Architecture platform, the 2019 model features all-new bodywork and cabin design, plus a new powertrain that delivers more power, better fuel efficiency, and improved capability – on and off the road. The all-new super-sporty XSE Hybrid model is sure to make waves, with standard AWD among many exciting features. Intuitive standard and available technologies and features include the Entune 3.0 entertainment and information system, Apple CarPlay, a new all-wheel drive system, multi-terrain select system, hands-free power lift-gate, a digital display rear view mirror, and more. The new RAV4 also sets new standards for safety, with the introduction of Toyota Safety Sense (TSS) 2.0 – the next generation of active safety features designed to enhance a driver’s capabilities to help keep everyone safe on the road. Everyone deserves to arrive safely, which is why more than 95% of Toyota vehicles now have standard-equipped Toyota Safety Sense features. Highlights of the new TSS 2.0 include an updated pre-collision system with enhanced deceleration capabilities, enhanced pedestrian detection, cyclist detection, “road edge detection” and new ‘lane tracing assist’ to increase the vehicle’s ability to help drivers stay in their lane even more, an updated Full-Speed Range Dynamic Radar Cruise Control and more. The new RAV4 joins a full range of Toyota models, including the all-new 2019 Toyota Avalon, the ever-popular Corolla and Camry, the legendary 4Runner and Tacoma, the street-savvy Toyota 86 and C-HR, and the world’s most popular and proven line-up of stylish and efficient hybrid vehicles. The 2018 Edmonton Motorshow takes place April 12-15 at the Edmonton Expo Centre.